If you want to bring some order on your Windows desktop, easy find and launch your favorite applications or have an instant access to your favorite websites then Krento is what are you looking for. 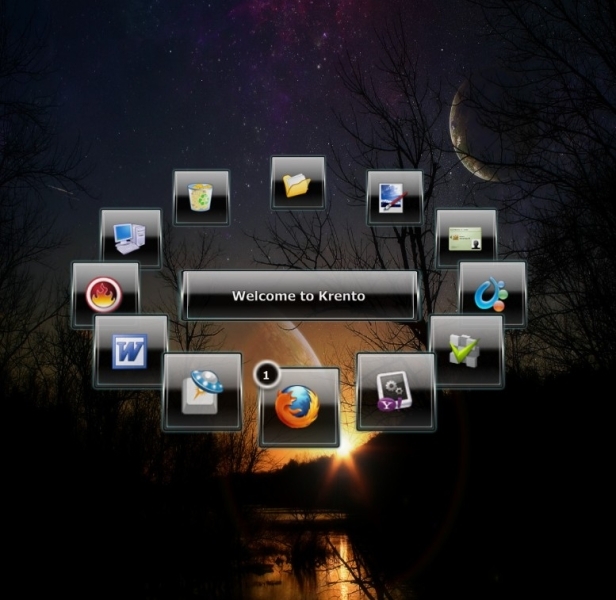 Krento is a modern desktop organizer which combines the functionality of the Application Launcher, Application Dock and Widget Engine in one small and powerful application. The flexibility of Krento is based on the original Widget Engine that serves as a motor of Krento. This means that it can load and display widgets (graphically rich interactive objects) on your desktop. Widgets can do anything from display the current date and time, to launching other applications or opening websites in your browser. There are some of widgets already available and the number of it is growing all the time. Unlike other Widget Engines, Krento is more oriented on functionality than on decoration. Statement: First, please download the orginal installation package by clicking the download link. Of course you may also download it from the publisher's website. Using Krento crack, key, patch, serial number, registration code, keygen is illegal. The download file hosted at publisher website. We do not provide any download link points to Rapidshare, Hotfile, Depositfiles, Mediafire, Filefactory, etc. or obtained from file sharing programs such as Limewire, Kazaa, Imesh, Ares, BearShare, BitTorrent, WinMX etc. Software piracy is theft. If you like Krento please buy it.